NHC being announced in our backyard in Bellevue last year got our club thinking about a barrel project. We wanted to produce something that represented the mission and character of our club and a sour barrel project seemed like just the ticket. While we knew that other clubs in the area were receiving barrels from the Washington Homebrewer’s Association, we made the assumption that the majority would be of a red wine variety since most white wine barrels are re-purposed for red after their oak properties have been fully extracted. So, in order to be a little different, we set our sights on acquiring a freshly emptied white wine barrel. The process was intensive and after contacting nearly 60 regional wineries, we lucked out when Maison Bleue Winery told us that just two days prior, they had racked their award winning Petite Joie Marsanne from the barrel. One of our club members, Derek made the trip across the mountains to pick up what would turn out to be one of two beautiful French oak barrels (more on the 2nd barrel later). A grain bill generally light in flavor so as not to mask the flavors of apricot, peaches, and marzipan that the wine that was once in the barrel exhibited. Wheat should be used in significant quantities (~30%) so that there’ll be plenty of long chain dextrins for the bacteria and brett to feed on during the long fermentation/maturation process. IBUs should be kept below 12 so as not to inhibit any lactic acid production from lactobacillus. To enhance complexity, the greater the variety of strains of bacteria/wild yeasts the better (so long as they’re proven). Individual batches should be inoculated with souring organisms no later than primary fermentation. SRM should be no higher than 4. In the end, eleven different batches of wort were brewed and each was fermented at home before the barrel fill day. The data on each individual recipe, as well as aggregated barrel stats, can be viewed by clicking here. 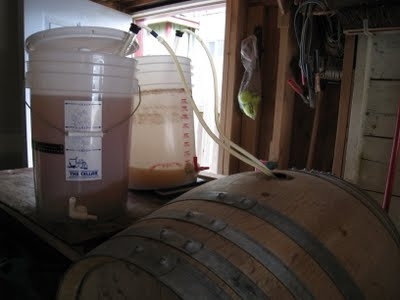 On June 7th, 2011, we all transported our beers Paul's house where the barrel had been previously set up in his garage. Since the barrel had been emptied and gassed with sulfur dioxide only 6 days prior, it was recommended to us by Vinnie C. at RR that we fill up the barrel with water the night before so as to help flush out any lingering gas which would otherwise potentially inhibit the growth/reproduction of our desired souring organisms. So, after draining the barrel of the water, we then flushed it with C02 and racked in our different beers. It's almost a year later and the beer is coming along very nicely, but different than expected. The original thought was to have a beer sour enough to stand up to aging on apricots (going for that sort of Fou’foune thing). At the moment, the profile is very delicate and refreshing. We're very happy with the beer as-is, but will continue to let the majority of it age in the barrel to see if the sourness develops further. At NHC, we'll be serving this pure version that has been aged for a year in the barrel. We'll additionally have a sample of the same beer that was kept in a corny keg for a year so you can see what the large format barrel aging did for the beer!